Compare the modern toothbrush to brushes used a few hundred years ago. You’ll notice the brushes we’re using today look pretty much the same. That’s not necessarily a bad thing. The mechanical hammer hasn’t seen many big improvements in recent history, either. Making a better toothbrush is difficult. How can you improve upon something so simple? 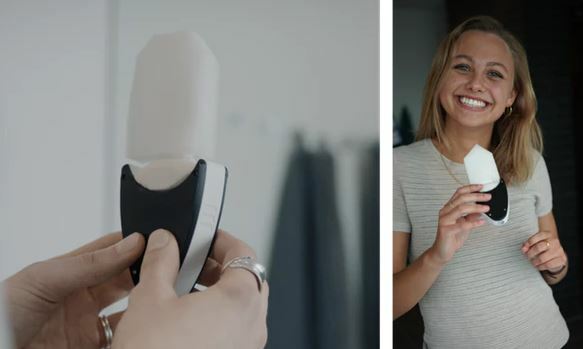 Nevertheless, the UNOBRUSH is basically an attempt to make a 21st century design toothbrush. UNOBRUSH is actually a crowdfunded project through Kickstarter, which managed to raise about a million dollars in pledges. 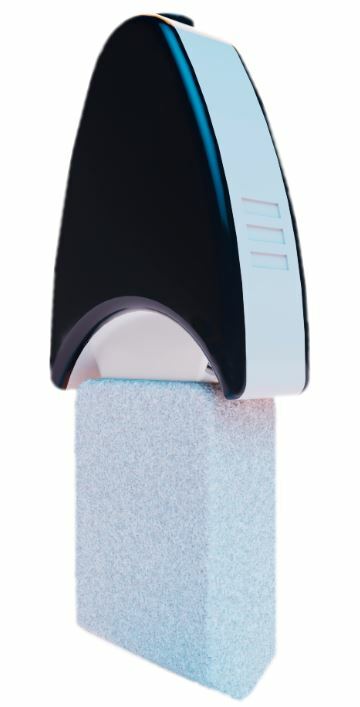 It’s being billed as the world’s smartest anti-cavity toothbrush. Claiming this toothbrush fights cavities is like pointing out that food prevents starvation. But nitpicking aside, this brush does aspire to clean your teeth faster and more effectively than an ordinary toothbrush. In fact, UNOBRUSH is supposed to finish its cleaning in about six seconds. The brush itself looks almost nothing like a toothbrush. It has about the same dimensions as an ice cream sandwich. Consequently, it’s small enough to hold in one hand and fit inside your mouth. The base looks somewhat like a plastic Starfleet Communicator Badge, while the topside is attached to a square medical-grade sponge. The base module is fairly simple, composed of a lightweight polymer composite. The front and backside are black, while the sides are white. Again, not unlike an ice cream sandwich. The unit is clearly made to feel natural in your hand, though it spends little time in that location. The sponge looks a little silly because it’s not a permanent fixture, it’s intended to be added and removed. When you stick the sponge in your mouth, the badge-portion of the device remains in front of your face. That’s similar to a regular toothbrush, except you don’t need to hold anything. How does the UNOBRUSH work? The general idea is simple. The design is based on patent-pending UNOfoam technology, which can reach nearly every surface within a person’s mouth. Brushing your teeth basically works by physically removing bacteria and the foods they digest. Instead of brushing, the UNOBRUSH is operated by biting into the foam, causing it to wrap around your teeth. It’s worth noting that this technique is intended to help clean the gums as well. A few things can be said with certainty. The UNOBRUSH is made with a universal design. 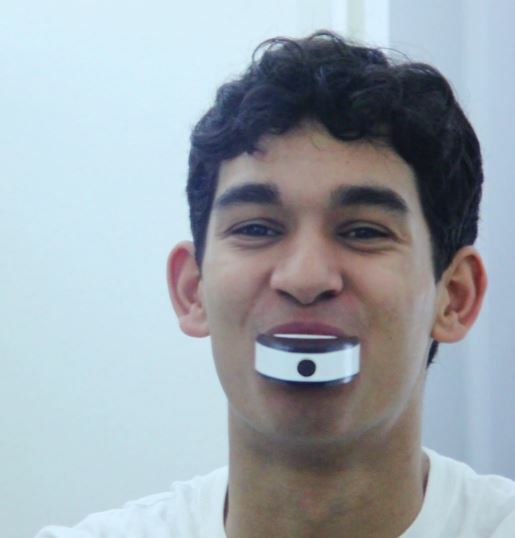 It has a one-sized fits all mouthpiece which can physically reach nearly every surface of your teeth. Even if you have a particularly large or small mouth, the UNOBRUSH is built to be adaptable to essentially anyone over the age of five. To its credit, the UNOBRUSH makes use of pulsing sonic vibrations to help provide some scrubbing motion against your teeth. It’s intended to allow for essentially the same level of cleaning you’d get from brushing with a regular brush, except drastically quicker. If the design proves to be effective, it seems clear the UNOBRUSH could become an enormous success. There are actually many ways mechanical toothbrushes are disadvantageous which UNOBRUSH does not mention at all. If you brush a little too firmly, mechanical brushes can wear away your gums or enamel. UNOBRUSH presumably provides far less room for error. And because it doesn’t require mechanical motion, it’s presumably far more accessible to people with certain types of disabilities. If you’ve ever taken a look at ultraviolet cleaning wands, you may have noticed that some of them are capable of cleaning in only a couple of seconds, and from distances of about 8-inches. The idea the UNOBRUSH can clean out your mouth in six seconds is very plausible, especially because it has such close proximity to what it’s expected to clean. Attaching a new UNOfoam is basically as simple as sliding it into place. The foam becomes attached as you rotate the circular base clockwise by 90-degrees. Removing used foam is equally simple, using the opposite motion. The foam then snaps into place, and can be used immediately. Using the UNOBRUSH is basically as simple as docking it, cleaning it, and charging it. You do so with the included storage case, which basically looks like a toaster that’s been placed on its side. The UNOBRUSH is loaded into the front-face of the toaster by sliding out a narrow drawer, then sliding it shut. The number of drawers is actually something that varies from one set to another because the UNOBRUSH is available with several different docking stations. Why care about the docking station? Because the station itself contains another UV cleaner, which helps to sanitize the mouthpiece after it’s been used. Since this is a wireless device, there’s a small battery involved to power the UV light. Keeping the battery charged up takes minimal effort, but it is one added step to maintenance. From one charge of the brush, the battery life is estimated to be about two weeks. And UV lights tend to be good for about two years of continuous use. On the other hand, each UNOfoam has a maximum lifespan of about one month. That’s actually two or three times more often than you need to replace a toothbrush, though replacement can be made simpler with the UNOsupply service. Like with regular toothbrushes, it’s possible to keep using the foam a little longer than you ought to. But like toothbrushes, you really want to make these replacements on time. 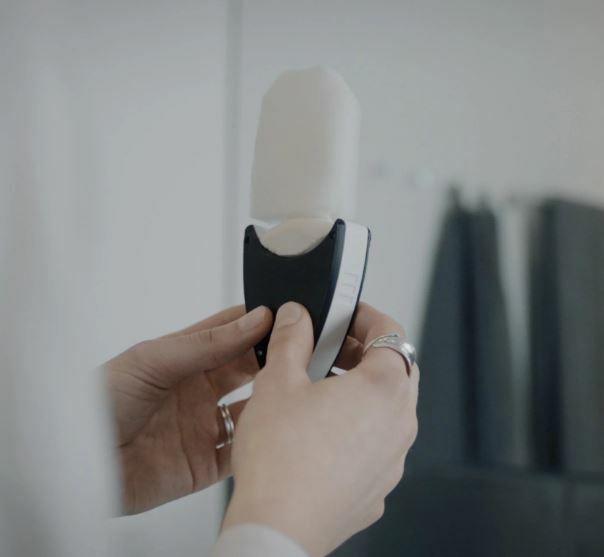 Similar to an ordinary toothbrush, the UNOBRUSH can be used by anyone over the age of five. 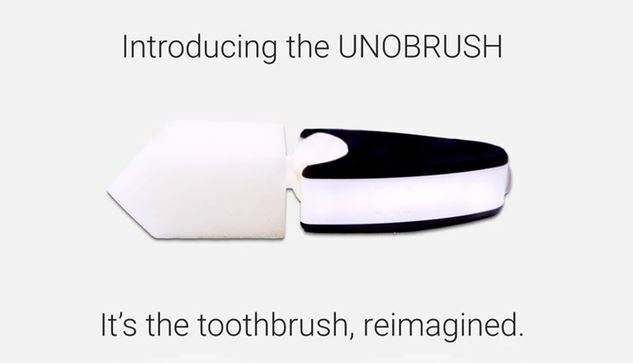 The UNOBRUSH can also be used with any toothpaste. But because this is intended as a replacement for brushing, it would make more sense to forget toothpaste and switch to an oral rinse that contains fluoride. While the UNOBRUSH is intended to replace regular brushing, flossing is still just as necessary as with using a regular toothbrush. Like with a regular toothbrush, the UNOBRUSH will not clean the spaces between your teeth. To get that job done, you need floss. The UNOBRUSH kit includes a supply of one dozen UNOfoam and a docking station for the brush. They also offer a one-year warranty that covers product replacements. Your oral health is important. 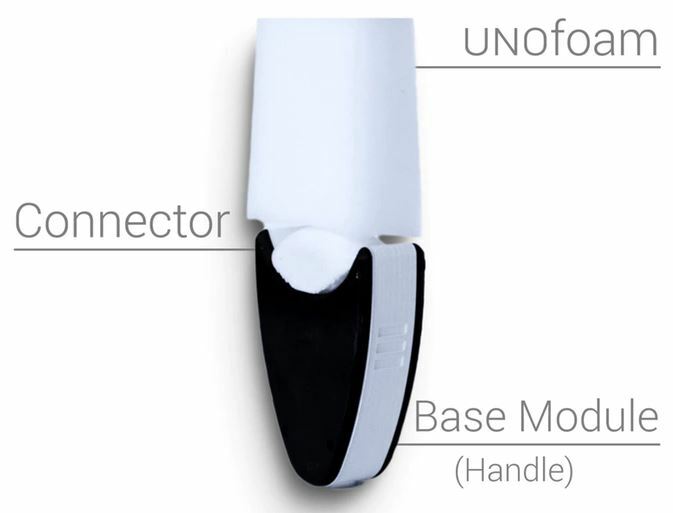 The UNOBRUSH is an interesting and potentially revolutionary device. But we’re ultimately talking about a medical decision, and this tool does not have years of independent testing behind it. Nor does it currently have approval from the FDA. The UNOBRUSH makes many amazing claims, and it’s likely everyone on their staff believes wholeheartedly in the project. But when it comes to the efficacy of a device like UNOBRUSH, anecdotal experiences are not a substitute for research from independent testers. Making medical decisions without the recommendation of your doctor is often a bad idea. It’s even worse to make those kinds of decisions without consulting studies published in peer-reviewed scientific literature. In other words, being informed is important. And it’s hard to be adequately informed about this kind of thing without years of research. Who Should Try the UNOBRUSH? UNOBRUSH claims their technique is twice as effective as alternatives, but you probably shouldn’t stop brushing your teeth. On the other hand, brushing and also using the UNOBRUSH would certainly be worth a shot. If you’re interested in giving it a try, UNOBRUSH is estimated to ship in Spring of 2019. Adding six seconds to your brushing routine isn’t the same thing as cutting your brushing time down to six seconds. But if it really works at effectively eliminating the bacteria found inside your mouth, then devices like the UNOBRUSH may become a common necessity in the near future. If you’re cautious, the UNOBRUSH could be a modern, cool, and very hygienic addition to nearly any home bathroom. Your analysis seems to be quite unbiased and covers many areas, and it’s very much appreciated. Do you know of any peer-reviewed independent testing on this new product ? If not, how would one go about accessing those ?